This groundbreaking study explores the recent dramatic changes brought about in Japan by the influx of a non-Japanese population, Filipina brides. 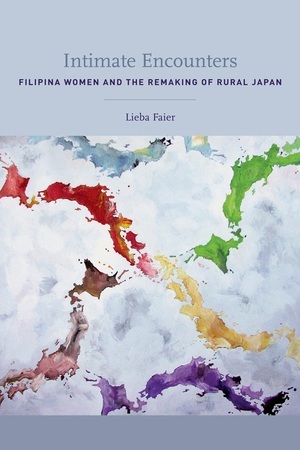 Lieba Faier investigates how Filipina women who emigrated to rural Japan to work in hostess bars-where initially they were widely disparaged as prostitutes and foreigners-came to be identified by the local residents as “ideal, traditional Japanese brides.”Intimate Encounters, an ethnography of cultural encounters, unravels this paradox by examining the everyday relational dynamics that drive these interactions. Faier remaps Japan, the Philippines, and the United States into what she terms a “zone of encounters,” showing how the meanings of Filipino and Japanese culture and identity are transformed and how these changes are accomplished through ordinary interpersonal exchanges. Intimate Encounters provides an insightful new perspective from which to reconsider national subjectivities amid the increasing pressures of globalization, thereby broadening and deepening our understanding of the larger issues of migration and disapora. Lieba Faier is Assistant Professor of Geography at the University of California, Los Angeles.